theimps.ka - Davide Somma : The Greatest Loan? Davide Somma : The Greatest Loan? In our latest addition to our ex-files section, we look at arguably the great loan signing that the Imps have ever made. 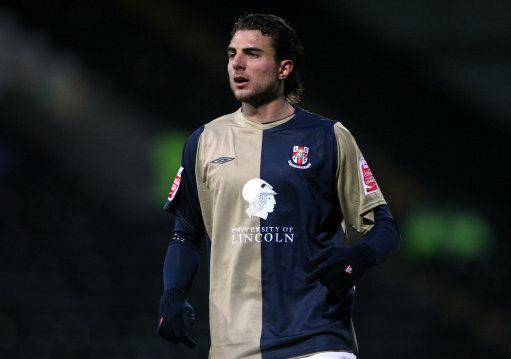 Davide Somma was on loan at Lincoln City from Leeds United towards the end of the 2009/10 season, going on a career best goalscoring run that eventually ended up giving him the chance of football at Championship level. The one position in football that everyone remembers is the striker. More often than not, the striker is the hero of the season, scoring the goals that win you promotion, get you in the Playoffs or save you from the drop. The recent past has seen numerous examples of City having excellent strikers, with Jamie Forrester, Gary Taylor-Fletcher and Adrian Patulea all averaging a goal every three games or better, but all were poor in comparison to Gavin Gordon. Gavin Gordon was at the club from 1997 to 2000 before leaving for Cardiff City. Before leaving he had scored 26 goals in his final 41 games for the club, a seemingly unbeatable goals:games ratios, that was until Davide Somma arrived at the club. The South African moved to America at the age of five and ended up playing football (as in the proper version and not the American's version of rugby) for Sarasota Storm and St Pete Raiders. He represented Tyler Junior College and was eventually named in the National Junior College Athletic Associations Region XIV First Team (try saying that whilst drunk). Due to having an Italian passport, Somma was able to play freely around Europe and joined Logrones, but he failed to make an appearance there before moving to Perugia. The club went bust in his first year and he moved to Pro Vasto, scoring just twice in his 39 games there. His record at Olbia, his next club, wasn't any more impressive, netting just once in 15 matches. 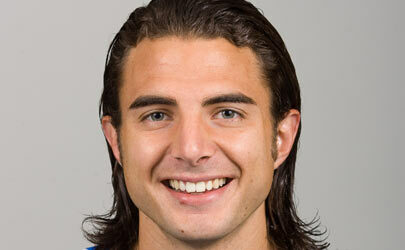 A move back to America saw just three appearances for San Jose Earthquakes. It was at this point when he decided to try his luck in England after being encouraged by former Lincoln star, Darren Huckerby. He had trials at QPR and Leeds United, the latter of which signing him up on a one year contract. Injury hampered his progression or first team chances and he was eventually loaned out to Chesterfield. His debut saw him miss a penalty in a 3-2 defeat at Saltergate to Crewe. His spell there ended soon thereafter. It was playing for Leeds reserves that he caught the attention of Lincoln City and he joined the Imps in February 2010, just days after the Imps had lost 4-0 at Port Vale. Ironically his debut would come against Crewe, the same team who he had made his first appearance against a few months earlier for Chesterfield. He didn't exactly have a busy game, but did get on the scoresheet as he smashed a shot in off the near post from 20 yards. He had become an instant hit for the Imps and despite not scoring in his second game at Rochdale, he did make it two goals in three games against Hereford. Brilliant close control saw him half volley in off of the underside of the bar to start the Imps on the way to a 3-1 victory. It became 3 goals in 4 games days later as he gained City an equaliser against Dagenham at home. Although the fans were already under a great impression of what he could achieve, it was an away game at Torquay that showed his abilities. Somma opened the scoring within the first ten minutes before Torquay equalised just before half time. Somma created City's second goal brilliantly as he waltzed around several defenders before laying the ball off to Cian Hughton, the midfielder slotting in from close range. Somma completed the scoring for the Imps after latching on to a defensive lapse to round the goalkeeper. His loan spell reached it's end, but thankfully he and Leeds agreed for him to stay at the Imps until the end of the season. The stay wouldn't be made permanent though as Leeds offered him a new deal, based purely on his form at Lincoln. Somma subsequently failed to score in any of the next three games following on from the Torquay game and it appeared as though his mind might be elsewhere. A tricky home game against Bournemouth saw Somma regain the goalscoring touch though, scoring two very different goals. The first had seen him released before subtley slotting it beyond the goalkeeper, the second of which was not subtle in the slightest. After being played through by Keltie, Somma volleyed over the goalkeeper from the corner of the box to score a very memorable goal, a goal that was amongst the contenders for Goal of the Season. City's survival was still up in the air before a home game with Bury. With Grimsby picking up form, it was obvious that the Imps needed something special, especially given that the Imps hadn't beaten Bury for five calendar years at the time. Six minutes from time and Somma was played through again, slotting home beyond the Bury goalkeeper to secure City's Football League status with two games to spare. His final goal for Lincoln came at Aldershot, but his last game for City came against Macclesfield and ended in disappointment. Somma was sent off for headbutting a Macclesfield defender, but he received a standing ovation from Imps fans as he left the pitch. He ended his career at City by scoring 9 goals in 14 games. The summer followed with virtually all clubs in League One and Two wanting to bring Somma to their club. There were strong rumours that City did have a bid accepted, only for Somma to then reject the offer on the table. It was said to be the only bid that Leeds had even considered for the striker. After he had served his three game ban for the aforementioned red card, a ban that saw him miss a Carling Cup game between Leeds and Lincoln, Somma made his Leeds League debut against Millwall, coming off of the bench to score two goals. Both goals were excellent and you can see from the picture below that the relief was all over his face. Somma now finally appears to have settled in England and he has a bright future ahead of him. It is highly unlikely we'll ever see him in a Lincoln shirt again, but one thing is for sure, City owe their Football League status to Somma. Re: Davide Somma : The Greatest Loan? Lets seriuosly get real guys...Grella will not be coming to us....no more daft speculation please. Jae Martin was very good on loan as well in the mid-90s, but flattered to deceive once he had joined permanently. Neil Matthews got a sackful of goals on loan as well I seem to remember. A lot of players who are good on loan turn out to completely change once they join permanently.....Marcus Richardson, anyone?? Crikey 2 blasts from the past. Jae Martin was totla pants once we signed him up...just got worse and worse. So sad, 'cos he did have ability but clearly didn't want to get involved and show it...I always thought he seemed a bit scared as he wasn't very big...there were better players in the lincoln Sunday league by the time he packed in! Battersby? Got to say he fooled me too. Looked great on loan (Bradford away remember) then scored a cracker home to Wigan in our first home game after promotion....then got fatter and fatter and slower and slower. Nearly as bigger freeloader as Foley...seen milk turn quicker than Battersby! Forrester wasnt bad!! Carl Cort was surely the loanee that went on to best things?